This week’s edition of Fresh Food Friday and Seasonal Saturday is being posted while I’m visiting my family in the Midwest. I don’t need to tell anyone how sweltering hot the weather has been in this region and other areas of the U.S. I hope that you’re all taking care of yourselves, your loved ones, and your pets during this intense weather pattern. What a wonderful array of recipes were shared last week, and all worth being featured this week. Both new bloggers and regular bloggers to this get-together are selected. There are eight highlighted recipe and garden posts for you to check out and visit; they are all wonderful! 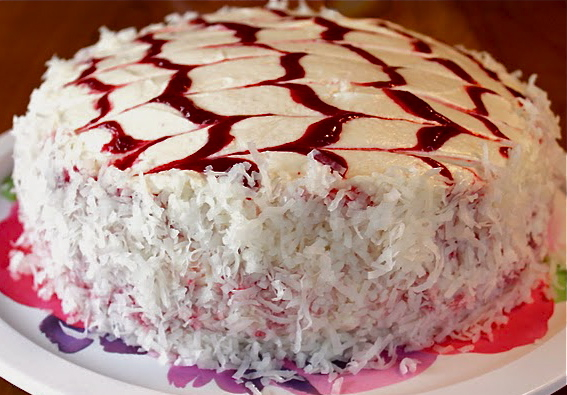 Visually stunning, and undeniably mouth-watering, this awesome Raspberry Zinger Cake was brought to the get-together by Yammie from Yammie’s Noshery. 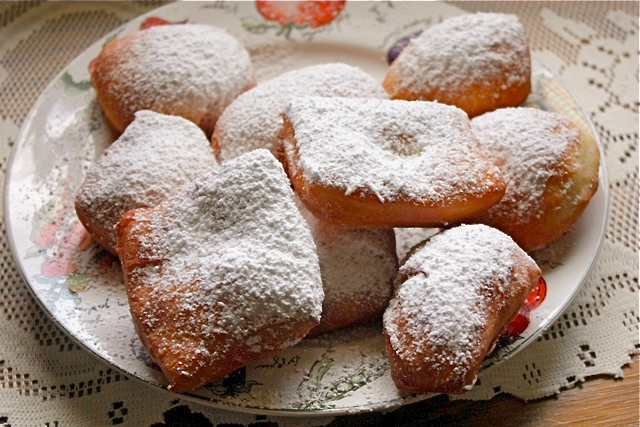 Erin from “art + food + life” brought these sweet, warm French Quarter Beignets. Perfect with a cup of java! this yummy recipe was shared by Beth from Slice of Southern! 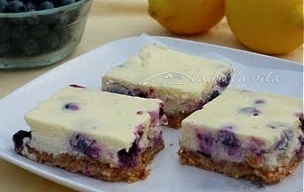 4 Sisters from Crumbs and Chaos linked up these light and refreshing Lemon Blueberry Cheesecakes. The colors are so vivid and inviting, aren’t they? 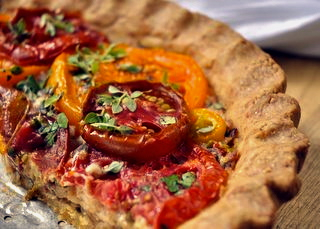 Here’s a great recipe to use some of them from Scrambled Henfruit: Heirloom Tomato Pie. 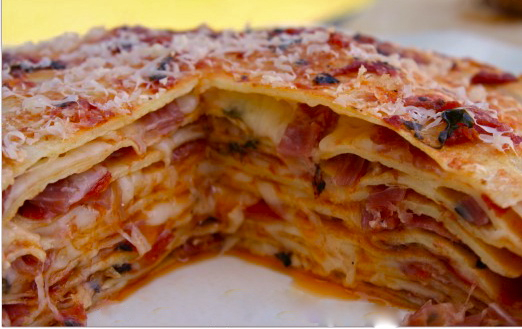 Look at this outstanding layered pasta recipe, “Layered Crespelle with Tomato, Prosciutto, and Cheese” posted by Heather of girlichef! What a creation of culinary beauty to enjoy! Here is the “I’ve Been Featured” button to place on your post or anywhere on your blog . . . the code for this button is on the bottom of my sidebar on the right. Thank you for your kindness and time to participate! I appreciate each of you, whether this is your first visit or if you’ve been linking up each week for some time. I hope that you have a wonderful weekend. The Traditional Food of Emilia-Romagna, Italy! A Taste of Emilia-Romagna! Hi Roz! I’m sharing my Blueberry Bread Pudding w/ Lemon Sauce. Thanks for hosting and have a great weekend! Hi Roz, This is a beautiful display of yummy fresh food! The heirloom tomato pie looks particularly delish. OMG I’m hungry AGAIN! I’m back again this week and have posted my recipe for Mango flavored Crêpes this time:)Great pics of Chicago in your earlier post!Have a great weekend! Drooling at all those yummy dishes, especially the lemony desserts. Thanks for hosting! another yummy roundup Congrats to these wonderful talented foodies and thank you again for being the lovely host! You’ve done it again! I’m going to have to start making more than 3 meals a day to sample all these goodies! Thanks so much for hosting! I hope you are having a wonderful vacation despite the heat. I’ve linked up a Catalina Dressing recipe that I’ve recently discovered. It’s just in time for a cool salad. I can’t wait to visit all of the other wonderful entries. Have a beautiful weekend and stay cool! The featured bloggers look amazing this week – with some of my favorite friends!! I am linking up my Lentil Soup and a delicious fruit dip. I thought about you when I was making my soup – an Italian treasure! 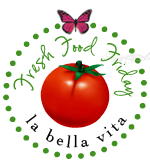 Thanks for hosting another week of Fresh Food Friday! Can’t believe how many entries there are already. I’m taking advantage of fresh figs this week–amaretto figs. Hi Roz, Every week I say to myself this is the best yet and every week I’m so wowed by everyone’s posts. Everything looks so delicious, I wish it wasn’t so hot so I could spend time in the kitchen. Maybe next week I’ll turn on the stove : ). Thanks so much for hosting. Have a wonderful holiday and hope you stay cool whenever possible. What a great food blog–great pics! Thanks for inviting me to your party. I’m following you back. hiya Roz, thanks for the invite to link up! I am following you back, this is a super delicious looking blog! Thanks Roz for the invite! I hope to join each week. I’m your newest follower of your blog and your networked blog on Facebook! Hi Roz, Thank you for visiting and following my blog. You have a great site here, am following you too. Thank you too for the invite, I have linked up the Strawberry Frozen Yoghurt to share. There are so many delicious food linked up, will be visiting some of them soon. 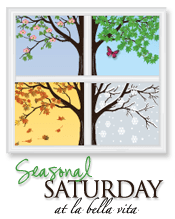 This is a great blog hop. Thank you! 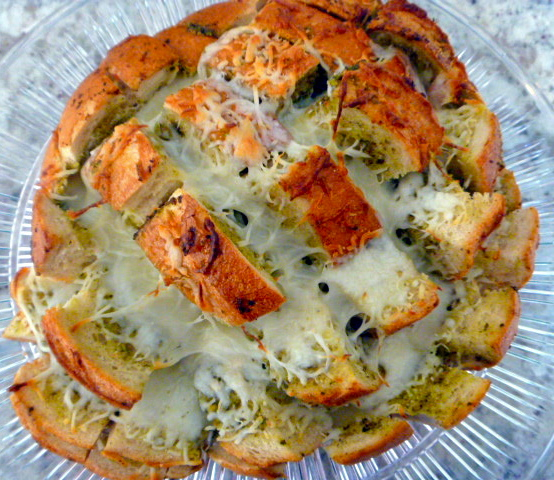 Hi Roz, thanks for featuring my Cheesy Garlic Herb Bread! How exciting this all is!! I’m going to go look for another recipe to share and link up to this weeks party…thanks again!! Love your site! Everything looks so delicious. Gotta check these blogs out. Roz: I’m so glad you stopped by. Such delicious recipes. I enjoyed your visit with you son. We’ve never done the boat architectural tour but now want to. 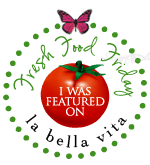 Thank you so much for featuring my Garden and its harvest,it is an honor to be featured on your blog, you are so kind.I have shared my Skillet Chops this week. I am so sorry to be late this week. I had eye surgery and am still recovering and trying to do a little posting with one eye. Hope to be better soon. Hope you are having a great week end! Oh wow, I really want a crespelle now and I don’t even know what it is. LOL! I tried to link recipes from both of my blogs and linky did not work. I will try again later.